Home » The Best Brownies – Never Fail Better Than the Box! The Best Brownies – Never Fail Better Than the Box! What makes an easy brownie recipe? One that doesn’t take much time and tastes good – right? 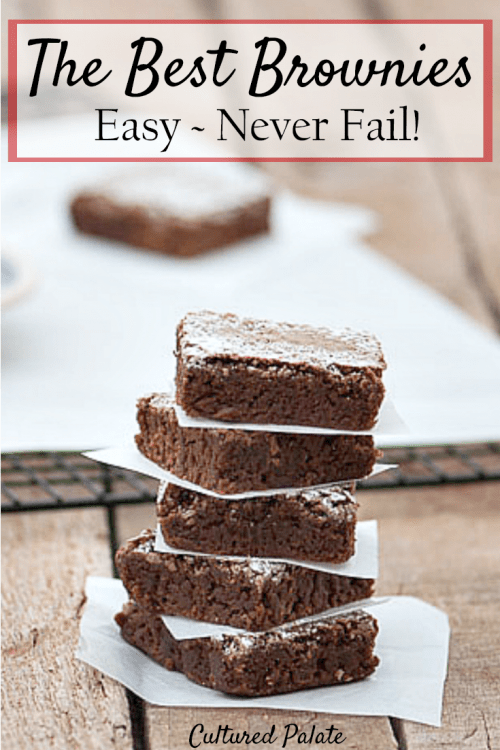 Well, the Best Brownies are those that are not only easy but never fail! In fact, this easy brownie recipe is actually better than the box mix brownies! Not only are they super easy, they do not have unnecessary nasty ingredients. Fruits and vegetables are seasonal – they come and go. But brownies – ahhh… Brownies are ALWAYS in season! Have you wanted an easy brownie recipe that turns out great every time and is quick to throw together? I know what you’re thinking. A box brownie always turns out right, doesn’t it? That’s why they were invented: So people could get the same kind of brownie every time. Even if you couldn’t cook to save your life, those brownies were great. Don’t worry, I’m not judging! After all, I only used box brownie mixes for years.. Cooking and baking hasn’t always come easily for me. Often my homemade brownies would turn out dry or, the recipe was so involved that it took too much time. Plus all the extra wet ingredients, and the different amounts of eggs from recipe to recipe… it’s amazing that we have any consistent brownie recipes out in the world at all! 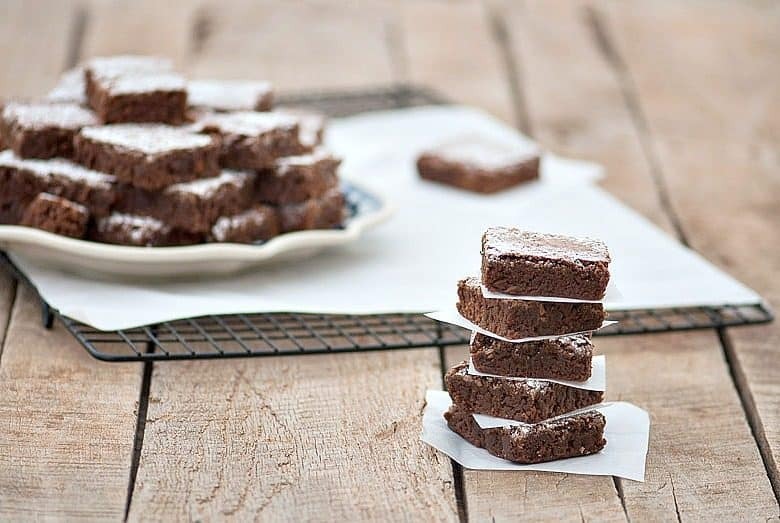 With the following easy brownie recipe, your brownies problem is solved! As the name says, these brownies NEVER fail! They truly are the best brownies. The original recipe was one I found in my recipe basket from my mother. I can’t tell you how much inspiration has come from that little basket. And, it turns out that the easy brownie recipe I had been searching for was right in front of me the whole time! With some tweaking, these brownies now turn out perfect every time. They consistently taste delicious and come out of the oven with just the right texture, no matter what your skill level! In addition to that, this recipe is a winner no matter what your brownie preference may be. I’ve found that people enjoy these brownies whether they prefer a compact, fudge-y brownie or a lighter, cake-like brownie. So, the next time you need a quick treat to take somewhere or to munch on for your own enjoyment, give this Never Fail Brownies recipe a try. Really, it takes me 10 minutes to get these in the oven! I know what you’re thinking – yes, I did time myself! I wasn’t going to just tell you a time and then not follow it up with the facts. OK, so I might be a bit obsessive compulsive about all this. But, I am always looking for ways to make tasks more efficient – what else does the mom of a large family have to do? Seriously, that thought process goes into most recipes I develop for you all. I want you all to enjoy delicious, real food, of course. But, I also try to give you the most efficient recipes I possibly can. Why waste time in the kitchen and away from your family if you don’t have to? I thought about comparing my timing in preparing a boxed brownie mix with my recipe, The Best Brownies recipe. But no, I haven’t done it – yet! 😉 That really would be the mark of an obsessive person! I love homemade replacements without the unnecessary ingredients! So, while a boxed brownie mix might be a little bit faster to make, I prefer homemade. By using this easy brownie recipe, you don’t have any unnecessary ingredients. Brownies are a treat at our house. We don’t always enjoy little treats on a regular basis (I try to stick to the 80/20 Rule), but this is one I definitely don’t mind having more regularly. When a treat doesn’t take forever to make, you want to make it more often! And I have to admit, I love to eat the batter – shhhh, don’t tell the children! So, when you make the Never Fail Brownies, make sure to lick the beater. And the bowl. And your fingers! After backing, sprinkle the top with powdered sugar for a more sophisticated look. I use a small mesh strainer to get a fine dusting of sugar. Never Fail Brownies - Better than the Box! Keep the ingredients on hand so you don't need a box mix. Mix flour, salt and nuts in a bowl and set aside. Using a hand mixer, combine melted butter, sugar and baking cocoa. Add eggs and vanilla and mix until blended. Beat in flour, salt and nuts - mix well. Spread in a greased 9 x 13 (or if making 48 brownies use two 9 X 13 pans). Bake for 25 - 30 minutes - until a fork comes out clean. While still warm, sprinkle with powdered sugar, if desired. Note: Nutrition has been calculated using honey as the sweetener of choice. I’m so excited to try this recipe, the brownies look perfect and I hate using box mixes because of all the nasty ingredients!